When You Read An Ingredients List Do You Feel Like A Moron? After spending 9 LONG years in higher education, you would think that Snack Girl would understand the basic chemistry of food. Alas, she is lost when looking at some food packages. whole wheat flour, water, high fructose corn syrup or sugar, wheat gluten, yeast. Contains 2% or less of: soybean oil, salt, calcium sulfate, extracts of malted barley and corn, honey, corn syrup, soy flour,dough conditioners (sodium stearoyl lactylate, calcium dioxide, ethoxylated mono and diglycerides, dicalcium phosphate, mono and diglycerides, datem and/or azodicarbonamide), yeast nutrients (ammonium phosphate, ammonium chloride, ammonium sulfate and /or monocalcium phosphate), Enrichment (vitamin E acetate, ferrous sulfate, zinc oxide, calcium sulfate, niacin, vitamin D, pyridoxine hydrochloride, folic acid, thiamine mononitrate and vitamin B12), Wheat starch, cornstarch, maltodextrin, vinegar, calcium propionate (to retain freshness), whey, soy lecithin. 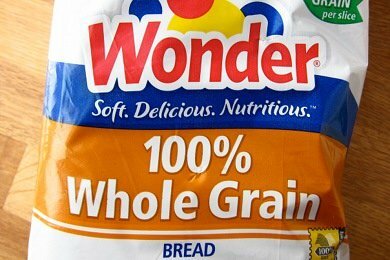 So, what I wanted to do was tell you guys that it was great that Wonder Bread can be found in Whole Wheat. But, after looking at this list I "felt like a moron". Fortunately, I found Ruth Winters and her book- "A Consumer's Dictionary of Food Additives" (2009). Ruth has tirelessly catalogued all the food additives for SEVEN editions to help people like me feel smart again. AZODICARBONAMIDE - A bleaching and maturing additive for flour. Used in amounts up to 45 ppm. The FDA wants further study of this chemical for both short-term and long-term effects. Although allowed as a food additive, this is no current reported use of the chemical, and, therefore, although toxicology information may be available, it is not being updated. This is a potentially serious problem. See Semicarbazide. I chose azodicarbonamide on purpose because I know that this chemical has been banned in Australia and Europe. USA, hello? And, yeah, I would avoid it. There are breads out there with ingredients lists that look like this: whole wheat flour, water, salt, yeast and they taste better so I wouldn't buy this bread. Snack Girl: You have written 7 editions of "A Consumer's Dictionary of Food Additives". What inspired you to start? Ruth Winters: When my daughter was about 4 years old, she had a terrible case of hives which neither the pediatrician nor the allergist could find that causes. And that’s how I started. Like everyone else, I thought the FDA was looking over every food producers shoulder to check the ingredients of food. I found I was really naive.
. The latter two books are now in their seven editions recent released and the second edition of "POISONS IN YOU FOOD" is still available in stores and on line. Snack Girl: Do you think the FDA is doing its job? Ruth Winters: There are dedicated people in the FDA but they are grossly understaffed and underfunded and are a political football. For example, the formulae for cosmetics given to the FDA are strictly voluntary and the FDA promises the companies they will protect the info from competitors. There is one FDA person in the room with the secreted formulae and when he or she has to go to the restroom, the door to the room is locked and unguarded. The new FDA director seems to be enthusiastic about changing things but we will have to see if she can…there are a lot of cuts and controversy going on in government. The food additive and cosmetic manufacturers have powerful lobbies and a lot of money. Everytime the FDA has taken them to court, the FDA spends a lot of its sparse money and loses the case... so most of the time, they don’t bother. Now most of our food additives and cosmetic ingredients are made in China and India. The FDA in a gesture, opened up a three-person office in China to oversee the multi-billion dollar food and cosmetic ingredient industries. Snack Girl: When you go grocery shopping, what do you absolutely avoid? Ruth Winters: Hint of Salt Triscuits and plain popcorn. Thanks so much, Ruth! I gotta try those Triscuits. How do you feel about food additives? My wife asked me to purchase ingredients for a Weight Watchers' lower calorie pie. It included key lime jello (tons of additives - fake food), graham cracker pie crust (contains trans fats), and Cool Whip (lots of trans fats). I call this low calorie key lime pie, the Trans Fat Pie. Unfortunately, when we think of losing weight, we are not looking at the other side of the coin ... health. Many times when something is "low-fat" or "fat-free" it's full of artificial sweeteners and additives. If it seems unnatural for a cake to be fat free, that's because it is. It's sad, when people see that something is "low-fat" and they think it's healthy but it's not. Hi Snack-Girl. This is a very useful post. Thanks for sharing. Well, I fell sad about this, because the people who make this kind of "food" they are only thinking about money, money and money. They don't care about anything else. A clear example is when Ruth Winters talks about the milk and the penicillin (Great interview by the way). I try to avoid all the low-fat, 0 calorie foods, etc. I'm glad to know that I'm not the only one. I don't like the "HFCS or Sugar"...which is it? Because I will NOT eat anything with HFCS but will sugar. This sentence says it all: "There are breads out there with ingredients lists that look like this: whole wheat flour, water, salt, yeast and they taste better so I wouldn't buy this bread." Thanks for once again raising my awareness. Great Post. It certainly pays to be educated about the ingredients in our foods. Once you learn about all the unnecessary junk in our foods - you begin to wonder who's looking out for us - the consumers? And now the FDA is considering changing the name of "High Fructose Corn Syrup" to "Corn Sugar" on packages - which could mislead consumers. @Angie - I wrote this a while back http://www.snack-girl.com/snack/toast/ - I like Alvarado Bakeries bread which you can find in the "Natural Foods" freezer section - Ezekiel bread is another good choice. There is an organic white whole wheat at Whole Foods which my kids love and has a very "clean" ingredient list. It is difficult because so many of the packaged bread have a bunch of preservatives to extend shelf life. Anyone read Food Rules by Michael Pollen? He nicely sums up what you should (and shouldn't eat) and indeed has simple guidelines, like don't eat anything your grandmother wouldn't recognize, or packaged foods with more than about five ingredients. A quick, easy, and incredibly informative read. The first responsibility must fall upon us, the consumer. Label reading and research using reliable sources is mandatory. Blaming the "food industry" is vague (what about all the members doing a good job?) and not very efficient. Put your money where your mouth is; if we quit buying crap then producers would stop selling crap. Unfortunately, I'm preaching to the choir because the people reading this are probably more educated about the subject than the average citizen, but what are you doing to educate those around you? Snack Girl has her blog, Allison is reading labels with her kids, and I'm a Family and Consumer Science teacher in a public high school. I've even been known to educate people in the aisles of the grocery store (it embarasses my children but those I talk with appear to appreciate the information.) Talk to your neighbors and your kids' friends, write your Representatives, cook meals with a group to freeze for later "fast food," raise chickens in your back yard (legal in most cities to have 3 hens,) plant a tomato this year... it all helps. I'm an obsessive label reader, because my son has life threatening food allergies. Thanks for the reminder that ingredients aren't just potentially deadly in the short term, but unhealthy in the long! The lack of regulation of ingredients on health & beauty products is especially infuriating to me. My son has had more than one reaction (hives) to different hair products, and once I barely found out there was milk in an asthma med before giving it to him. Buying bread in the supermarket is torture for me. I can easily kill 30 minutes picking up and putting down packages trying to find the shortest and most recognizable ingredient list. My latest solution: buy sliced bread from a real bakery and freeze it. Then we always have fresh, real bread on hand. Wondering what we as American can do to change this? I can't afford to buy all organic, but it's crazy that we are basically being poisoned. @Joleen: Eating local is a great way to initiate food change. As Melanie said above, join a CSA, find a farmer's market or farm stands (her link: http://www.localharvest.org/csa/ will help you find all of those). Food & buying cooperatives are also a great place to find healthy and affordable food: http://www.coopdirectory.org/. Some farmers grow chemical-free without being able to afford organic labeling--ask around. You can make food change through your purchasing choices. Educate yourself & educate your friends & family. If you've got non-chain supermarkets, make requests for healthier/locally sourced/organic/chemical free products. Many stores will do special orders with no extra cost; some offer discounts for bulk orders, too. PS: I make my own bread because I can't stand that grocery store dilemma--and I can't afford the amazing artisan bread a few local bakeries sell. It's easier than you think, and you can make several loaves at a time and freeze 'em. Or, make up an 'ice box' dough and bake fresh rolls/bread every day. I love the comment above of the woman eating totally healthy except for SPAM... that it is probably one of the worst foods and cancels out our thoughts that you otherwise eat healthy! I think we are question "what really is SPAM?"